Yesterday, I had the privilege of attending the NYC premiere of the new 3D animated film, Epic. While the day was certainly eventful [ in addition to attending the premiere we had the opportunity to interview Colin Farrell, Chris O'Dowd, Amanda Seyfried, Aziz Ansari and director, Chris Wedge] - the profound wisdom imparted throughout the film is what's at the forefront of my mind today. These three quotes [also pictured above] really stuck with me. "You're here for a reason - sometimes the connections aren't always clear - but they're always there"
"Many leaves, one tree - we're all individuals but we're still connected - no one's alone"
"Just because you haven't seen something - doesn't mean it's not there"
What wonderful messages to send to today's youth! There's real substance to the storyline of this inspiring film, that evokes thought, which is refreshing. 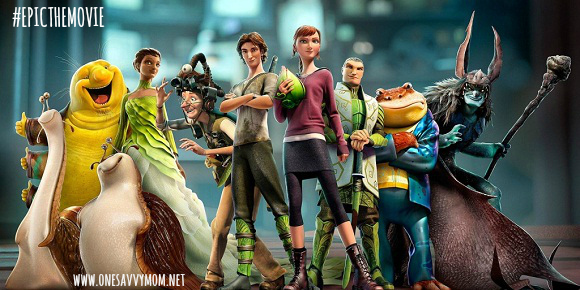 In addition to the inspiring storyline of Epic, the 3D animation is simply breathtaking! A definite MUST-SEE family film. Keep an eye out for my review of EPIC, interviews with the voice cast and director [Colin Farrell, Chris O'Dowd, Amanda Seyfried, Aziz Ansari and Chris Wedge] and more over the next few days. Starring the voices of Beyoncé Knowles, Colin Farrell, Aziz Ansari, Chris O'Dowd, Josh Hutcherson, Christoph Waltz and Amanda Seyfried.